Our conversation lasted all of 10 seconds, but it will stay with me for the rest of my life. I’m speaking of the precious moment that I shared with one James Earl Carter, Jr. nearly 20 years ago in Dallas. I was a grad student; he was the former 39th President of the United States. Better known by his preferred nickname Jimmy, the 70-something-year-old ex-POTUS sat that day at a small table in a cozy indie bookstore, signing copies of his new book Sources of Strength. The volume was billed as a compilation of his reflections on favorite Bible themes, and given his well-known history as a Sunday School teacher (a role he maintained even as president), it promised to be more than the standard existential musings of a former politician. So for the rare chance to meet a former president and buy a signed copy of his rather unique book, hundreds of us lined up out the door, around the corner, and down the block, braving the unusually cold, brisk December afternoon. President Carter had long held a special place in my heart. It began in my childhood, when he was the sitting president; I learned that he and I shared the same birthday, October 1. (Recently, I learned that his daughter Amy shares with my elder daughter a birthday, October 19.) My fondness for him grew in his post-presidency years, as I learned how active he continued to be in helping people in need, particularly by building homes for Habitat for Humanity. Two or three hours into my wait to see him, the line finally shortened enough that I could get inside the door and away from the chilly wind gusts. And there he was at the little table with pen in hand, looking much less intimidating than the tall, burly Secret Service agents that stood to either side of him. My conversation with the man took only a handful of seconds, but it has become a motivating force in my life. His quip referred merely to our shared birthday. Yet in recent years, it’s become to me a special charge, almost a passing of the baton, from him to me and millions of others to carry on our shared values. One of those values that he has long advocated for is human rights. He made it a touchstone of his presidential foreign policy whenever he could, and he kept on speaking and writing about it after leaving office. President Carter has also been known as a peacemaker. His crowning achievement as president was negotiating the 1978 Camp David Accords, which led to historic diplomatic relations and a lasting peace between Israel and Egypt. In 2002, Carter was awarded the Nobel Peace Prize for his lifetime of peacebuilding work, which has also included the monitoring of elections in a number of countries and the dissemination of medicines to eliminate diseases in the developing world. That same year, he became the first sitting or former president to visit Cuba since Calvin Coolidge. His efforts at rapprochment with Fidel Castro decades earlier as POTUS paid off. During the 2002 visit, the dictator gave Carter permission to speak via radio to the entire island nation about the need for democratic reform, while simultaneously calling for an end to the American embargo on Cuba. Another core principle of Carter’s: transparency. A mere two years after Watergate brought down the presidency of Richard Nixon, Carter campaigned on the promise that he would be a different kind of president. For one thing, he pledged to never lie to the American people. This went over well with the electorate, but it was likely also a genuine expression of his heart. In his post-presidential years, he worked to increase transparency in election financing in other countries. The pursuit of human rights, peacemaking, and transparency are just three of the values that so many of us share with former President Carter. We can continue to advocate and agitate for these as we receive the baton from him. Yet there’s one more of his core principles that especially resonates with me as a feminist father: his passion, now given the highest priority of his remaining years, for gender equality and ending violence against women and girls worldwide. I have become convinced that the most serious and unaddressed worldwide challenge is the deprivation and abuse of women and girls, largely caused by a false interpretation of carefully selected religious texts and a growing tolerance of violence and warfare, unfortunately following the example set during my lifetime by the United States. Who would’ve thunk it, right? 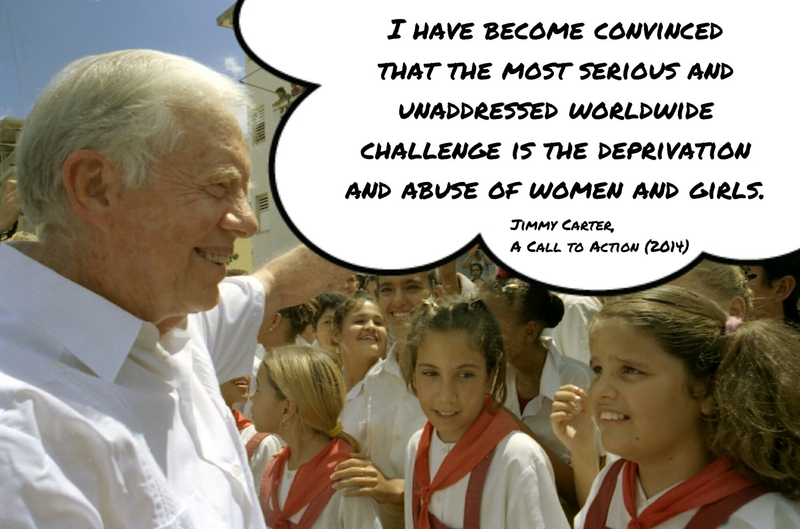 Jimmy Carter, feminist! Carter’s belief in women’s rights is yet another of his deeply-held convictions that millions of us share, and that we must pursue. It is my commitment to do so as much as I possibly can for the rest of my life. Of course, all of this is not to say that President Carter is without faults. Overall, he is not remembered as having been an effective leader during his term in office; that’s why he’s the only POTUS in the last 40 years besides George H. W. Bush to serve only one term. Yet in recent weeks, many of us have looked upon our current president and bemoaned his glaring lack of maturity. I hope that even as we resist and persist, that we will find inspiration and strength in the lives of heroic Americans on whose shoulders we stand, like President Carter. The photo at the beginning of this post, showing President Carter on his 2007 Ghana trip, comes courtesy of The Carter Center.